Green Day's new documentary Broadway Idiot will premiere at this year's South By Southwest Film Conference and Festival, which runs from March 8th to 16th in Austin. Directed by Doug Hamilton, the film tracks Green Day frontman Billie Joe Armstrong's foray into the world of musical theater while working on American Idiot, the stage adaptation of the band's 2004 album by the same name. It's one of two Green Day films screening at SXSW, along with the band's other documentary, ¡Cuatro! That movie, which premiered at this year's Winter X-Games, follows the band during the writing and recording of their recent album trilogy, ¡Uno!, ¡Dos! and ¡Tré!. 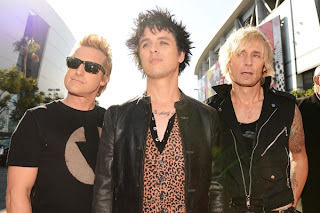 Green Day are set to return to the road on March 28th at Chicago's Allstate Arena after the band was forced to cancel and push back dates when Armstrong entered rehab following a meltdown at the iHeartRadio festival in September. The band has also added two additional dates April 16th at Berkeley's Greek Theatre, and a show at the Los Angeles Sports Arena on April 18th.